The novelist known as Edith Wharton (1862 - 1937) was born as Edith Newbold Jones. The Joneses were a wealthy New York family and one of Wharton's biographers claims that the phrase "Keeping up with the Joneses" is in reference to her father's family. 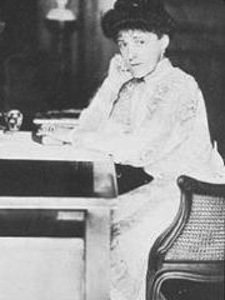 As part of America's privileged class, Edith Wharton was well-acquainted with many public figures of the day and counted Henry James, F. Scott Fitzgerald and Sinclair Lewis amongst her friends (Lewis dedicated his novel Babbitt to her). Wharton was the first woman to win the Pulitzer Prize for literature, taking that honor in 1921 for The Age of Innocence. Wharton's 1911 novel, Ethan Frome has become a staple of American Literature and is widely studied in classrooms around the world. In 1916, she was given France's highest honor, appointed Chevalier of the Legion of Honour, for her contribution to the War effort. We feature her work in our collection of World War I Literature. Wharton was awarded an honorary doctorate degree from Yale University in 1923, she was the first woman to claim that distinction. We feature Wharton in our collection of Pulitzer Prize Winners.